The Father is a new play by Florian Zeller, translated to English by Christopher Hampton. In 2014 the text won France’s highest theatrical accolade; the Moliere Award for Best Play. 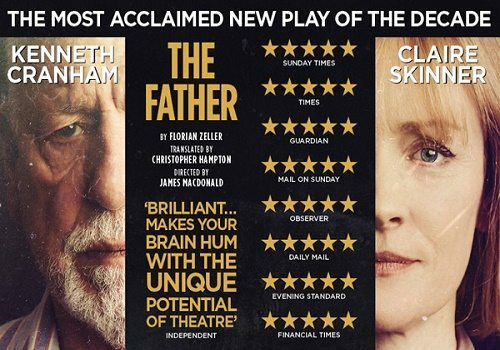 The Father arrives at the Wyndham’s Theatre following critically acclaimed runs at London’s Tricycle Theatre, the Ustinov Studio in Bath and the Cambridge Arts Theatre. The show will run for a strictly limited period from 30th September to 21st November 2015. The Father tells the story of an 80 year old man named Andre who can’t for the life of him remember whether he was once a successful tap dancer or an engineer. The one thing he does know is that he lives with his daughter Anne and her husband Antoine, or, wait, is it her lover, Pierre. The problem is that Andre seems to be wearing his pyjamas and can’t for the life of him find his watch. It all gets a little too much for him as he starts to ponder whether he is losing his mind. James Macdonald directs Tony and Olivier award nominees, Kenneth Cranham and Claire Skinner, who reprise their roles in this heart rendering and at times devastating play. The rest of the creative team includes Miriam Buether who provides set designs, Guy Hoare who provides lighting and Christoper Shutt who provides sound. Tickets to see The Father at the Wyndhams Theatre are now on sale.